When you’re locked up inside with a toddler, things can get a little hairy, these rainy day toddler activities could be a life saver. 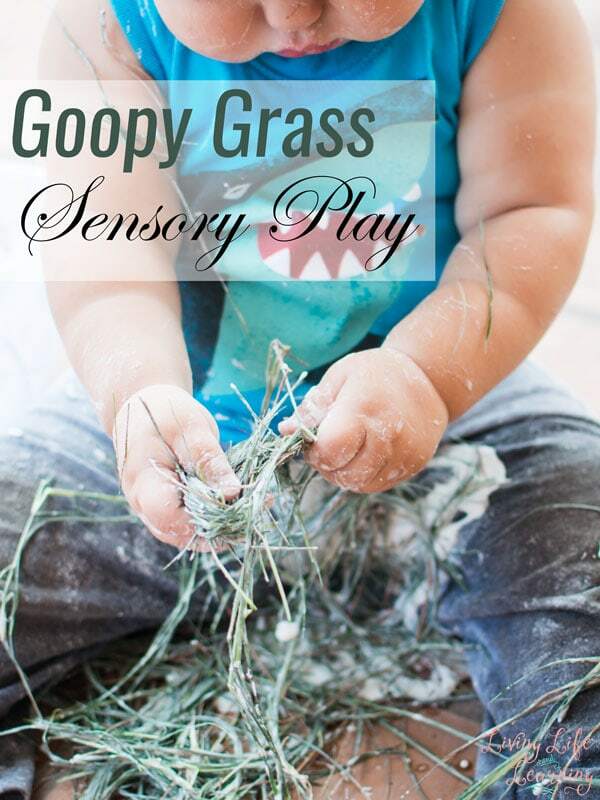 You can use simple items around the home to have a blast with your toddler. Who said no one could have fun in the rain? If you look in your cupboards right now, you already have everything you need for this simple toddler play idea. This is no mess and loads of fun. Bring outside indoors with these wonderful flower sensory soup, a great idea when you can’t get outside. 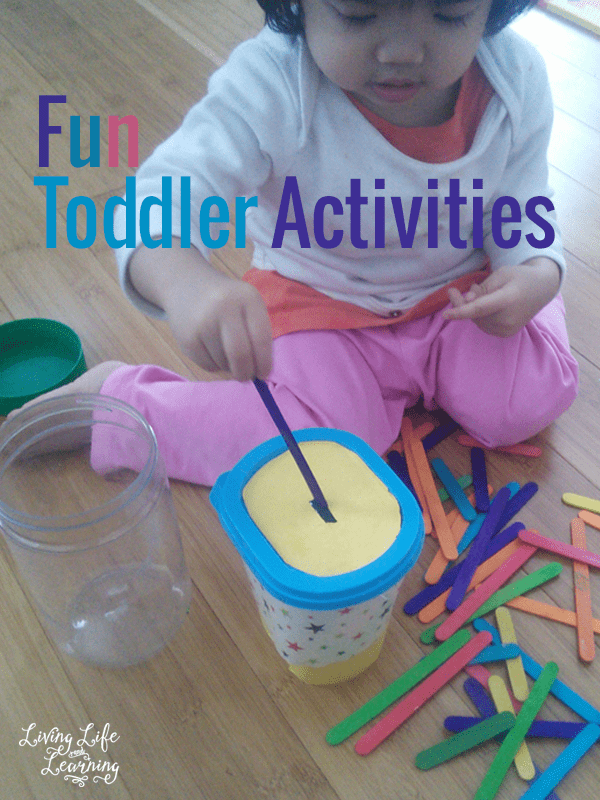 Take a look at these fun toddler activities you have to try. Bring the rainy clouds indoors with this fun finger painting project. What could possibly be more fun on a rainy day than going outside and actually playing in the rain? You only live once, mom! In “Princess Diaries” style, turn your staircase into an indoor “snow hill” to “sled” down! If you don’t feel comfortable using a mattress, try substituting with gym mats or card board. This will create hours of fun! Keep your kids entertained on a rainy day with this fun game while incorporating a little bit of learning at the same time. Although it does require some initial set up (cutting), practice numbers and patterns. Let creativity run wild and create a little town or city of houses and buildings out of paper bags. Create a rainy day box full of fun activities that you only pull out when it gets too wet to play outside. 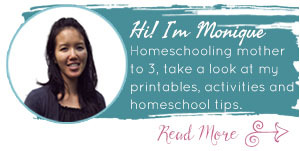 Here are a few simple ideas! A little bit of food color and rain mixed together makes for this fun and colorful painting project on a rainy day. What happens when everyday objects get wet? Take some items out into the rain and see how the rain changes them. Then have a discussion about it with your toddler. Pretend the floor is hot lava and hop from “island” to “island” all while developing gross motor skills. Learn even more rainy day songs, and use these rhythm packs to play different games with them as well! Pick a color and see how many items in your house you can find in that color. Then take a picture of all oft he things you find. 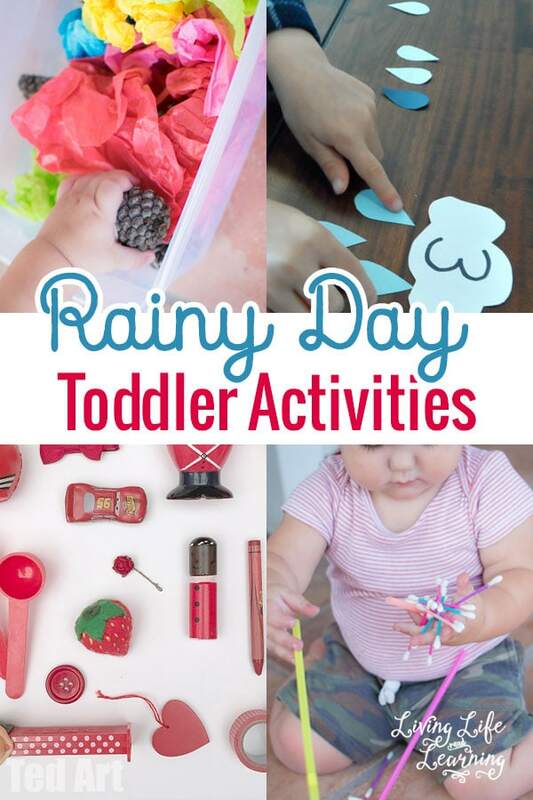 Take advantage of the dark skies on a rainy day to bust out the flashlights and play these fun games with your toddler. Just because its raining outside doesn’t mean you can’t bring the hopscotch inside! Learn this fun song and sing it with your toddler on your next rainy day, and it will help them with learning rhythm recognition, coordinated movement, memory, and exploring the sounds of the rain. This is a great list with a lot of really good ideas. I really like the “rainy day box”.